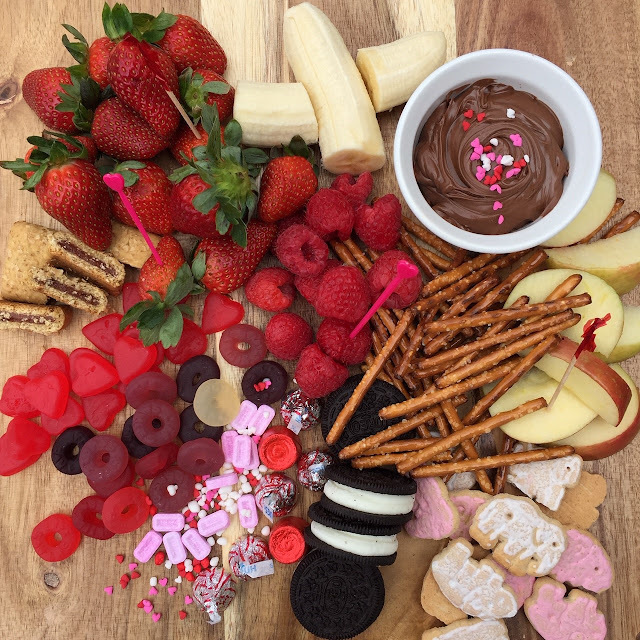 I am so excited to share this Valentine dessert idea with you today! I had the best time coming up with it and did a little practice run for my family. They were more than happy to taste test for me. They are so much fun and a really great way to get in a lot of different foods. 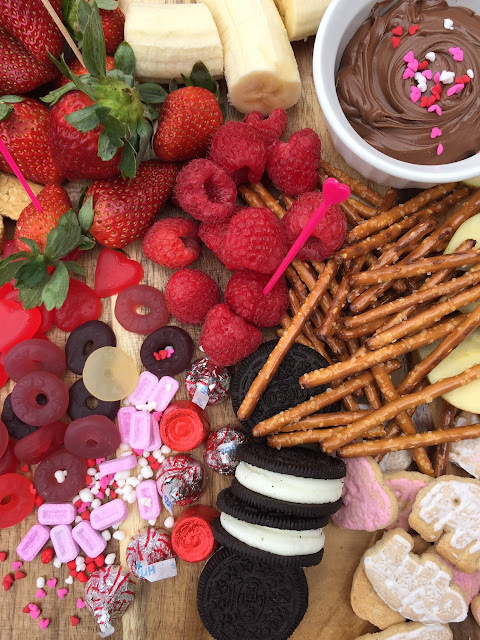 Let me introduce you to a delicious Valentine Dessert Board!! I tried hard not to go overboard with this dessert board. 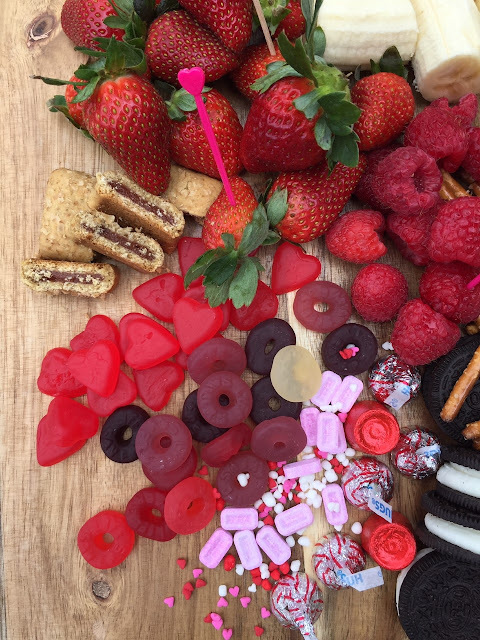 Have you seen those GIANT food boards that keep popping up on social media?? The ones that are the size of a giant kitchen island?? I just can't imagine having enough people over to eat a board of that size. It just seems wasteful. So I'm sticking to small. It's the perfect size for my family to snack on for a coupe of days around Valentine's Day. 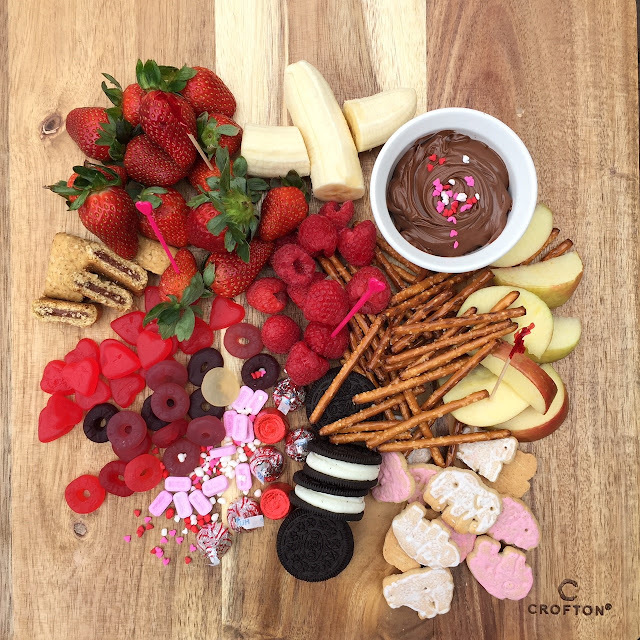 Which sweet treat would you go for first? I started with the chocolate dipped strawberries. I bought fresh fruit, raided my pantry and candy jar for Valentine's day treats and did not buy many new things for this board. Just a reminder: You don't have to go broke putting together fun food boards. Buy a couple new things and use a lot of what you have! 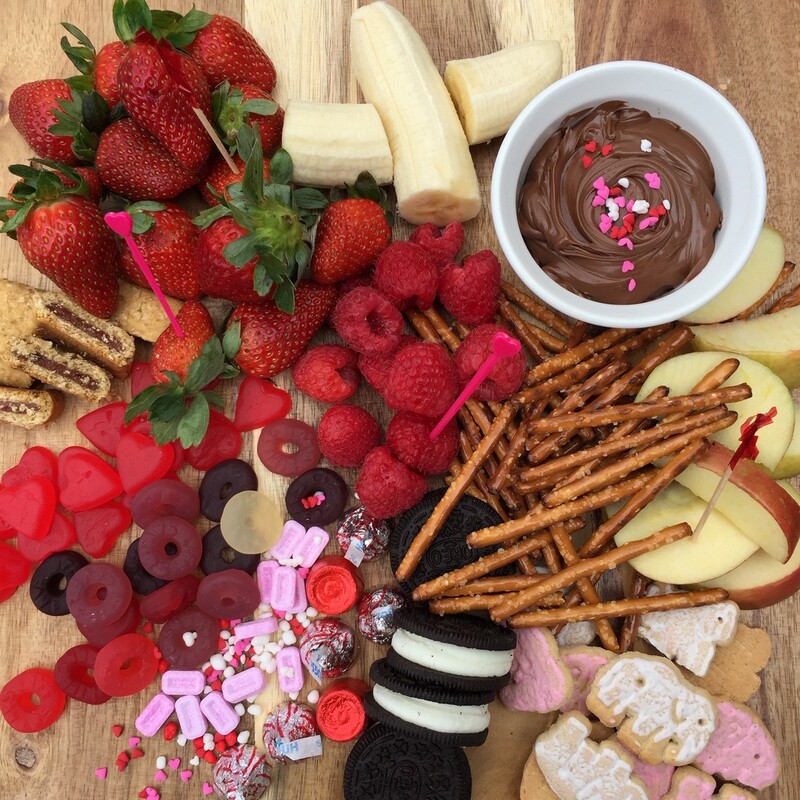 What Valentine's Day dessert will you serve to your family?? We have big plans to make valentines for friends, bake some cookies, mail out valentines, prep for Olive's Valentine's Day party at school and read all of our Valentine's Day books. Here are 12 of our very favorite Valentines/lovey books. There are so many cute options that would be the perfect valentine gift for the kids in your life. So cute. I may have to add this to our valentine’s tradition. I love it! I have been wanting to try something like this for a fun weekend treat. I think Valentine’s Day would be the perfect time. Thanks for sharing it early, so often times I see ideas like this but the holiday is the next day! This looks so fun! My kids would gobble it up! Love this idea! I also agree with the previous commenter that I love you posted the idea in enough time that your readers can plan and carry this out. I love this! It is beautiful and looks delicious! Great idea! This is such a cute idea! 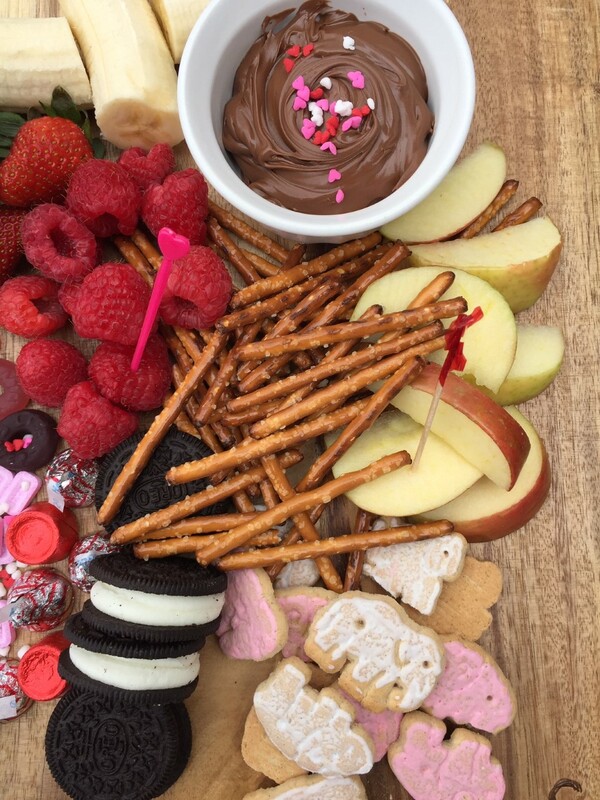 Another fun add in would be chocolate hummus. Sounds kind of crazy, but it truly does taste like chocolate! This is so beautiful and so yummy! Yum! I love the festive dessert boards!